As the Eye has repeatedly posted, the Go Hillsborough proposal was created through a crony and very flawed process resulting in a flawed plan (and a law enforcement investigation). But common sense (so lacking in politics today) did prevail last week. The county commissioners did the right thing and voted last Wednesday 4-3 NO. The proposed Go Hillsborough sales tax hike will not be on the November ballot. The Eye appreciates the four county commissioners who voted No: Commissioners Victor Crist, Sandy Murman, Al Higginbotham and Stacy White. Please thank them. Republican County Commissioner Ken Hagan sided with Democrats Les Miller and Kevin Beckner voting YES to putting the proposed 30 year 1/2% sales tax hike on the ballot. Hagan even doubled down after the 30 year sales tax hike got voted down and seconded a motion by Beckner for a 20 year sales tax hike. Why such behavior from Hagan? Because Hagan always supported another huge sales tax hike referendum. He has refused to consider anything else. We can only speculate about Hagan's position on the sales tax also being connected with his #1 focus - paying for a new Rays baseball stadium in Hillsborough County. Leytham is a very close associate of Hagan and Buckhorn. She is a political operative who has worked for both of their campaigns, often referred to as their campaign consultant. 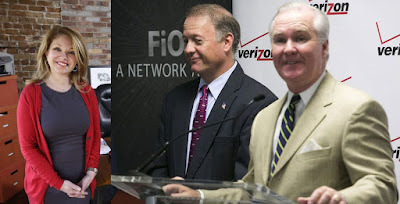 The Times reported right after Parsons Brinckerhoff was handed their million dollar no bid contract [with Leytham in tow] at the end of August 2014 that Mayor Buckhorn filed for reelection, and had assembled his same team of political operatives including Leytham and pollster Keith Frederick. Leytham used Frederick for Go Hillsborough polling conveniently circling our county taxpayer monies to Mayor Buckhorn's pollster. While Leytham was being paid hundreds of thousands of county taxpayer dollars to facilitate the public face of the Go Hillsborough campaign, she was orchestrating the behind the green curtain private campaign with at least Merrill and Hagan. The Eye received a copy of an email sent last week to the county commissioners and President of the Tampa Chamber of Commerce from citizen Tom Rask. Rask's email is a public record so anyone can get a copy of it. It contains information Rask received via a previous public records request he made last year. Today, in a widely distributed e-mail and in a blog entry posted on their Facebook page (which has over 5,000 followers), the Tampa Chamber insulted the BoCC majority who voted NO on Go Hillsborough last night. "We are disappointed that a majority the Board of County Commissioners failed to place a half-cent sales tax increase on the ballot this fall. As I stated last night during the public comment portion of the hearing  our community must make a significant, long-term investment in transportation. Kicking the can down the road is not what we expect of our elected officials nor what our community deserves. "So according to Bob Rohrlack, Commissioners Victor Crist, Al Higginbotham, Sandy Murman and Stacy White "kicked the can down the road last night". So if no recommendations on "funding options" were to be made until that second phase was completed, then why was Ms. Leytham discussing a timeline involving "Approve Ballot Language" with Comm. Hagan in the middle of this phase? She did so in e-mails on April 27th, 2015 (attached). In the attached e-mail (see below), Leytham induced a county commissioner to short-circuit the process she was supposed to be facilitating. That is exactly the kind of corruption of process that killed Go Hillsborough. Comm. Hagan can perhaps be forgiven for not knowing the exact details of the process, but Leytham cannot be forgiven because her company was the process. In my e-mail to you earlier today, I didn't do a touchdown dance over the defeat of Go Hillsborough. I didn't gloat. I've worked really hard to focus on issues, not people. I wish Mr. Rohrlack would've exercised similar restraint so that we can debate issues rather than insults. o Approve Ballot Language, Ordinance, etc. This email thread provides more evidence that the Go Hillsborough campaign was a taxpayer funded crony, phony campaign for another huge sales tax hike referendum. Leytham used her politically well connected "Insider" relationships to collude behind the scenes personally with Hagan and others on a referendum. Go Hillsborough used half-truths and flat out false information in their campaign messaging. Now we know why. It was Hagan who "jumped the shark" for a huge sales tax hike last April - right in the middle of the Go Hillsborough meetings when there was no plan and funding was not even being discussed. We later found out Hagan did that immediately after Go Hillsborough Leytham did a poll showing lukewarm support of maybe 50% who would support a 30 year 1/2% sales tax hike. This was the same poll that Go Hillsborough Leytham and the County refused to comply with my public records requests for the poll details until Channel 10's WTSP's Mike Deeson got involved. Why was Leytham telling Hagan in April 2015 about a proposed $450,000 Professional/Grassroots campaign for a petition drive to get the sales tax hike on the November ballot? A $450,000 campaign is NO grassroots campaign. Who else was Leytham involved in discussions with last year about some petition drive? Tampa Chamber? Mayor Buckhorn? Kevin Thurman? Mercury public affairs or some other PR firm? Obviously Merrill knew about some proposed petition drive because he opposed it. Merrill thought he was going to be successful in pushing public support for the sales tax hike so he opposed any petition drive at that time. While the Go Hillsborough campaign and the county were telling the public one thing last April, Leytham was busy behind the scenes orchestrating the sales tax hike referendum - while she was being paid lots of taxpayer dollars by the county through Parsons. Why did Hagan personally tell Leytham in April 2015 that a vote on the sales tax hike ordinance should be held at the October 7 BOCC meeting? Because Merrill kept stating "they" needed at least a year to "educate" the public….Who is acting as the information traffic copy and conduit for who? Now Kevin Thurman, the Executive Director of Connect Tampa Bay (CTB), our local transit lobbyist, is advocating for a petition drive. What a coincidence! As soon as the vote was recorded Wednesday night, mass transit advocates were calling for a grass-roots petition drive to put a transportation referendum directly on the ballot. It’s not clear whether they would be shooting for the Nov. 8 election or waiting until 2018. It would take 43,611 signed and verified petitions to put a measure on the ballot this year. “I think you will see people take matters into their own hands and bypass the county commission,” said Kevin Thurman, an advocate for mass transit. Was Thurman involved with Leytham's petition drive discussion last year? Kevin Thurman is also a close associate of Beth Leytham. Leytham intentionally used the same brand name "Go Hillsborough" as Connect Tampa Bay's 1% sales tax hike plan they publicly proposed in January 2014 named "Go Hillsborough". Maybe Leytham originally created the brand name in the first place for CTB. Obviously, collusion behind the scenes reigned throughout the entire Go Hillsborough debacle. What is more disturbing is Go Hillsborough was not an anomaly. Go Hillsborough is simply a symptom of bigger issues with how County Center operates. Shame on the Tampa Chamber and our local media for supporting such a crony flawed mess. Is this the type of behavior they accept from our electeds and high powered bureaucrats? The use of any means to justify the end - another sales tax hike referendum. Go Hillsborough debacle occurred under County Administrator Mike Merrill. There must be some accountability for this mess to regain trust and credibility. Going forward Merrill and his deputies, Beth Leytham and Parsons Brinckerhoff must be as far removed from our transportation issue as possible. For now - Good riddance to Go Hillsborough! I bet your next piece will be about the "TBX YES" campaign Sharon. It's so ironic how you bash Go Hillsborough left and right, yet you have clearly proclaimed your support for the disaster known as TBX. You say that we have to have TBX built or else we will continue to have "F-rated" interstates. Really Sharon? REALLY? You'd rather see our region have privatized transit and monstrous toll lanes that only a fraction of commuters will actually use? I'm really beginning to wonder who in heck is paying you to spew so much against transit and for TBX. I'm sure that the Koch Brothers are willing to dough out a million to you so that you can further advocate for the destruction of our transportation network. Yes, Go Hillsborough was a mess in many ways. Even I withdrew my support for it. But that does not mean that I agree with everything you've said about it. That definitely does not mean that I support your whacked agenda to cripple and privatize public transit in our region. That is what you want, whether you've expressed aloud about it or not. Each post that you write, you imply that you want HART, PSTA, MCAT, etc. to all be de-funded, slashed, and privatized. And you want all this to occur so that we are socked with toll lanes that we will be paying for...FOREVER! These lanes will NEVER be paid off Sharon. And if they are, it will take generations to do so. Go Hillsborough and TBX may have been separate issues, but specific powers in Hillsborough wanted the two intertwined. And now that Go Hillsborough is in the dust bin, I'm sure these same powers are already running to FDOT and your darling Governor to get TBX started ASAP. I agree that the "Politics As Usual" has to stop. But you are a part of the problem, not the solution. Anonymous resorts to name calling. Anonymous refuses to use their own name because apparently they cannot defend their own position. But Thanks for reading the Eye!